Darjeeling: Christmas is less than a week away and Darjeeling town is all decked up to celebrate the festival. The mistletoes are in bloom along the slopes; the sound of the choir practising at St Andrew's Church echoes across the hills; the aroma of freshly baked cakes and muffins wafts out of the town's favourite bakery, Glenary's; shops and restaurants are decorated with Christmas trees, north stars and festoons. The setting is perfect for a grand winter season. Only, the most vital ingredient is missing: tourists. The hotels that are usually abuzz this time of the year are conspicuously sil-ent. Hundreds of locals who depend on tourism for their livelihood have lost their infectious smiles. Even three months after the 105-day-long strike was withdrawn, tourists are still shying away from the Queen of Hill Stations. "This is threatening to spoil the Christmas-New Year party in the Hills," said a hotelier, struggling with less than 20% bookings for the season. The summer season, which generates the bulk of the business, was abruptly curtailed this year as violence gripped the Hills. Almost all the 400-odd hotels went without business during Durga Puja. There was hope that the scenario would normalise by Christmas, but business has been lukewarm with hotels reporting only 15%-20% bookings at a time when they are usually choc-a-bloc. "It seems the tourists aren't yet aware that the situation in the Hills has retuned to normal. Hence, booking for the December-January season, which is short yet significant, is very poor compared to other years. We are now banking on the Teesta Rangeet Tourism Festival to reignite tourist interest before next summer," said Tashi Phencho, owner of a popular hotel located in the heart of the town. With the September-October tourist season totally washed out and chances of a full-recovery in December-January appearing bleak, the tourist industry is staring at a Rs 50-55 crore loss this year, a third of what the hotel and travel trade industry earns annually. "The violence and agitation has done immense damage to the industry. With newspapers and channels flashing news of recovery of arms and explosives, the fear psychosis among tourist continues. There is little hope of tourists returning to the Hills any time soon unless there is a major initiative to boost their confidence. The five-day tourism festival will not have immediate impact, but we are hoping that it will help build confidence among tourists to return next summer," said the general manager of another hotel who wished to remain anonymous. Darjeeling town receives around 4 lakh tourists annually. Of them, around 3.5 lakh are domestic and the rest foreigners. While some domestic tourists are trickling back, foreigners are yet to return. 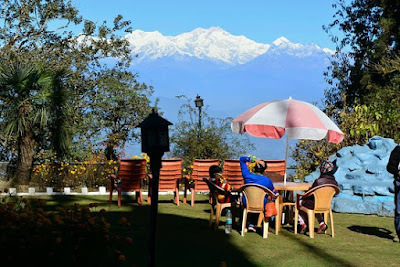 The tourist season in winter is usually short but draws tourists in large numbers with the St Andrew's Church, Darjeeling Zoo and Tiger Hill among the top draws. "The zoo attracts around 800-900 visitors daily in winter while 400-500 make it to the Tiger Hill despite the chill. But this year, there's hardly anyone yet," said a transporter. Rajesh Rajak, general manager of a well-known hotel, said bookings for the Christmas-New Year period were hovering around 30%. "We are not even getting adequate enquiries. That is what is worrying. Unless the perception changes, it will be a tough winter," he said. Where are all the tourists? Darj in cold despair - Christmas is less than a week away and Darjeeling town is all decked up to celebrate the festival.